You can buy tickets online and also check departure times with our ferry & hydrofoil booking engine. We give you the choice of reserving your space in ahead of your journey by purchasing in advance, or you can follow our guide and timetables below to buy your tickets when you arrive at the port. To use the booking engine below simply enter your outward and inward dates as well as your desired route. You will then be re-directed to the traghettilines.it booking page where you can check all of the details before making your purchase. If making your reservation via the booking engine above, please be aware that the tickets are provided by a partner site called "Traghettilines.it" who are also responsible for all transactions including payment and despatch of tickets. Please also be careful to note the charges before making any bookings. We offer this service as a convenience to Ischia Review visitors so that you have a choice between purchasing online or directly from the ticket offices at the relevant ports where the booking fees do not apply. If you need any advice on what's best for you then read our guide below or drop us a line at info@ischiareview.com and we'll be very happy to assist. However, any queries relating to the issue of tickets should be directed towards Traghettilines via their mail address which is prenotazioni@traghettilines.it or by phone on (0039) 0565 912191. If you're coming to Ischia with a rented car, when booking the ferry tickets, in the form select the brand and model of the vehicle you rent, and write RENT in the "licence plate" field. However, be aware that even though almost all companies offer the possibility to correct the number plate at check-in at no cost, sometimes an extra fee may be charged for updating the license plate in the company's system. Perhaps the smoothest way of transferring from Naples to Ischia is to take advantage of one of our private transfers. The service includes being met by a representative at the airport and then taken to the port where the ferry or hydrofoil tickets have already been bought for you. Then when you reach Ischia you are again met by another representative who will take you to your hotel, villa or apartment in Ischia. Prices per person are dependent on the size of your group but range from as little as €37.50 per person each way for a return transfer for a group of 4 or more, to €48.75 per person each way for a couple or €85 each way for a single traveller. The prices above include ferry tickets but for an extra €10 per person (each way) we can include the faster hydrofoils instead. In all cases we require full payment up front for the transfers which can be paid on-line via credit card, bank transfer or Paypal, subject to a small transaction fee. We'll then get straight back to you with prices and availability. Alternatively, you can now make a booking without having to write to us first. Simply select the appropriate link below based on the number of passengers. You will then find all the prices, options and details on how to make a booking. If your number of passengers isn't displayed please write to info@ischiareview.com for prices. All times are subject to change. Please check booking engine above for live timings and ticket purchasing. There are several companies that provide ferry and hydrofoil services to and from Ischia from mainland Italy. From the mainland you can catch ferries and hydrofoils from Naples or from Pozzuoli which is just a few miles from Naples. There are three ferry and hydrofoil ports in Naples - Mergellina, Beverello and Porta di Massa. In Ischia there are 3 different ferry and hydrofoil ports -Forio, Ischia (Porto) and Casamicciola. For anybody arriving in Naples by car and from the north such as Rome, Florence or Milan, then Pozzuoli is a great option as it means you can avoid the busy streets of Naples and leave the motorway before reaching the city. The quickest way to get to Ischia is by hydrofoil which takes an hour but is only for foot passengers. The ferry allows you to take a car and takes about an hour and a half. Some of the ferries and hydrofoils make a stop in Procida which is the island that neighbours Ischia. Prices vary depending on the route taken, the type of craft (ferry or hydrofoil) and the service provider. 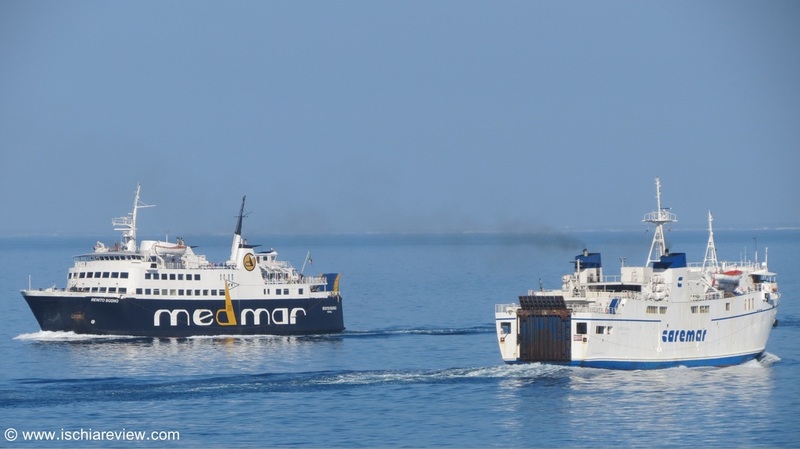 Ferries are provided by two companies - Medmar and Caremar, whilst hydrofoils are used by three companies - Caremar, Alilauro and SNAV. Medmar charge €13.20 for an adult foot passenger while Caremar charge €14.30 for an adult and €10.70 for a child between the age of 4 and 12. The price to take a car on the ferry depends on the length (in metres) of your car and the prices vary between €43 and €65. You can buy either single or return journey tickets but there is no cost saving to be made by buying a return ticket. Prices for an adult are €19.80 for a single journey - please note there is no discount for buying a single and a return ticket at the same time.